For as long as I can remember, I’ve been a procrastinator. It’s a dreadful habit that prevents me from reaching my full potential. Which is why I’ve been actively working on reducing my extreme procrastination for years. I’m not lying when I tell you that I’ve tried every trick in the book. Some tricks worked; some didn’t. The ones that worked I’ve probably already mentioned somewhere in my previous articles on procrastination. If I could only give you one piece of advice for overcoming procrastination, I would point you to the article you’re reading right now. I’m about to show you exactly what procrastination boils down to, the #1 skill you need to overcome it, and exactly how to obtain this skill. Sounds good? When and How Do We Procrastinate? Procrastination happens when we feel negative emotions – anxiety, boredom, frustration, overwhelm – toward a task. Because these emotions are uncomfortable (they literally cause pain in our brains! ), we try to avoid them. Hence, we procrastinate. It’s always the same story. We want to do something, but end up doing something else that feels better. In other words, we run away from our negative thoughts and emotions. At its very core, procrastination is an emotion management problem. It will always come down to that all-important moment of facing a task, experiencing the negative emotions associated with it, and doing the task despite those negative emotions. That’s the #1 skill needed to overcome procrastination: taking action despite experiencing negative thoughts and emotions. Taking action even if you don’t feel like doing it, even if you feel anxious about doing it, even if you feel overwhelmed, even if you feel stressed out. Newsflash: You are not your thoughts. And you are not your emotions. Thoughts and emotions just pop up, they come and go like clouds in the sky. They are like the weather. Sometimes it’s sunny; sometimes it rains – sometimes you feel happy and motivated; sometimes you feel sad and depressed. You didn’t author these thoughts – they just popped up out of nowhere. That’s what thoughts (and emotions!) do. That’s their nature. They pop up and then they disappear. They come and go. Just as the word ‘tank’ pops up when you encounter the phrase ‘Plenty more fish in the…’, negative thoughts and emotions will pop up when you’re trying to accomplish a challenging and somewhat uncomfortable task. If you’re trying to finish your essay, meditate, hit the gym, or do anything else worthwhile, chances are that negative thoughts and emotions will pop up. You feel a sense of anxiety, you feel overwhelmed, you feel stressed out, and you certainly don’t feel motivated. Your mind is telling you to do the task tomorrow. That’s when you’ll feel like it, that’s when you’ll be motivated. Do any of these sound familiar? Of course, right? It’s these thoughts and the accompanying emotions that lead us to procrastinate and keep us from engaging in healthy behaviors such as meditation, regular exercise, and so on. You see, it’s always the mind (thoughts and emotions) that gets in the way. You want to meditate, but your mind tells you to start tomorrow. You want to get up early, but your mind urges you to hit the snooze button. You want to finish your project on time, but your mind prefers to watch TV. Emotions and thoughts influence us to act in certain ways. Under the influence of strong emotions, we commonly make changes to our posture, voice, facial expression, and behavior. This is known as an ‘action tendency’ – when we feel angry, we have a tendency to shout, clench our firsts, and lash out physically or verbally. The key word here is tendency. Yes, we may have the inclination to do something, but that doesn’t mean we have to do it. We can feel angry but act calmly. We can feel afraid but act courageously. We can feel discouraged but keep going nonetheless. You can take action and do the thing despite experiencing negative thoughts and emotions. You can do things whether you feel like it or not. As I mentioned earlier, procrastination is an emotion management problem. When we procrastinate, that simply means we let our thoughts and emotions control our behavior. We run away from negative feelings and give in to feeling good. It always comes down to this. Do we stay put, experience the negativity, and act in spite of it? Or do we run away, give in to feeling good, and procrastinate. It’s always that moment that counts. We can either do the thing or run away. If we want to beat procrastination in the long-run, we need to get better at this. We need to take action and follow through despite experiencing negative thoughts and emotions. So, how do we get better at this? How can we loosen the grip our emotions and thoughts have on us? How can we do the thing whether we feel like it or not? The first step is to become aware of any negative emotions you feel and the myriad of excuses your mind is telling you right when it’s time to work on a task. When your mind tells you stuff like “I’ll feel more like doing this tomorrow” or “I’ll first check Facebook; it’ll only take a minute,” you need to become aware of such thoughts. Recognize that it’s just your mind trying to keep you from doing what you want to do. When you’re feeling anxious, bored, restless, or frustrated, you need to become aware of those feelings. “Oh, I’m feeling resistance towards this task. I feel an urge to procrastinate.” When you feel the urge to check emails, go on Facebook, have a cigarette, or run away in some other form, you need to notice that as well. If you don’t know that you’re about to procrastinate, how are you going to prevent it? You’ll just follow your unconscious urges and before you know it, you’ve wasted an hour dillydallying on Facebook. Our natural tendency of coping with negative emotions is avoidance – we feel anxious, frustrated, or bored when faced with a task and we run away. We distract ourselves with something that feels better; we give in to feeling good, we procrastinate. This is clearly not a healthy coping mechanism. So, what should we do instead? We must learn to tolerate negative emotions. We must realize that emotions are not the end-all-be-all. They are merely bodily sensations. Yes, they may feel uncomfortable. So what? They are just emotions. They come and go. We don’t need to react to them. Instead, we can just accept them and do the thing whether we feel like it or not. Remember, emotions are just ‘action tendencies’. We can feel angry but act calmly. We can feel anxious but act courageously. We can feel unmotivated but do the thing anyway. That’s the whole secret to overcoming procrastination. Become aware of negative thoughts and emotions. Let them be there. Accept them. Do the right thing despite them. Isn’t that great news? It means you’re no longer at the mercy of your thoughts and emotions. You’re no longer at the mercy of your motivation. No longer do you need to “feel like it”. You can just do the right thing – whether you feel like it or not. That’s freedom. That’s maturity. Now, the remaining question is: how do you get better at this? How do you become more aware and how can you learn to deal with those negative thoughts and emotions? Mindfulness is all about maintaining a non-judgmental, moment-by-moment awareness of whatever is happening in the present moment. This involves awareness of bodily sensations, thoughts, feelings, and the surrounding environment. The non-judgmental part is important because it entails acceptance, meaning that we pay attention to our thoughts and feelings without judging them. We watch them without labeling them as “good or bad”, “pleasant or unpleasant”. Mindfulness is the very thing that allows us to do what I’ve described in this article. It allows us to step back and watch our thoughts and emotions from a certain distance, without identifying with them. It allows us to feel negative emotions without freaking out and without reacting to them. Bringing it back to procrastination, it allows us to take action despite experiencing negative emotions. First, it raises our awareness of what’s going on. Second, it lets us stay with negative emotions without reacting to them, giving us the opportunity to do the right thing, regardless of how we’re feeling. And that’s not everything that mindfulness will do for you. 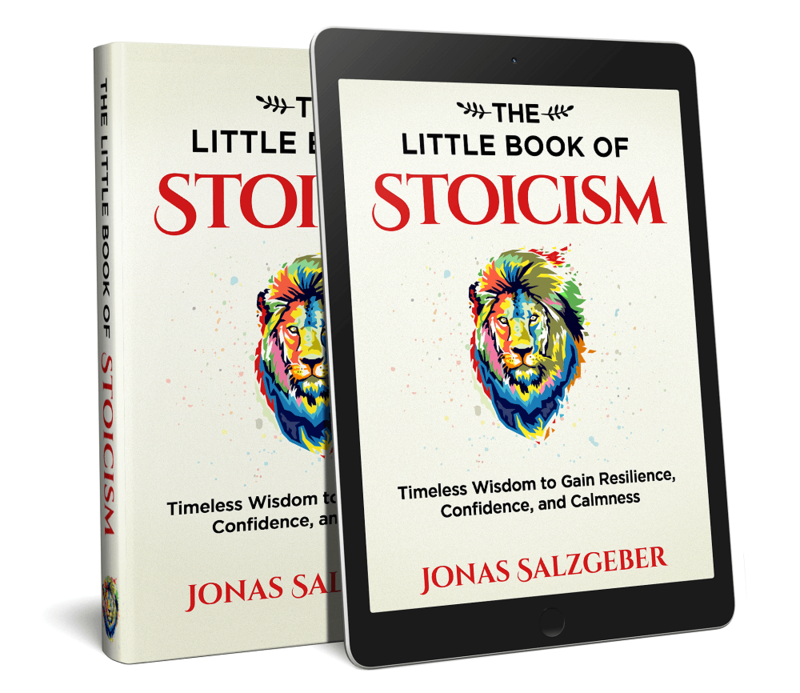 Research has shown that it will make you happier, healthier, more self-compassionate, more self-disciplined, better at tuning out distractions, and much more – all things that have been proven to lower procrastination. It lets us act regardless of whatever emotions or thoughts we’re experiencing. It makes us more self-compassionate (read why that’s important here). It improves our self-control and emotion regulation abilities. It helps us tune out distractions (read more about distractions and procrastination here). It makes you a better entrepreneur. My own experience supports this 100 percent. As I’ve said multiple times in previous articles, mindfulness is the #1 most important skill we can ever learn in our lives. Regarding procrastination, it definitely makes a huge difference for me – for all the reasons we have discussed in this article. It makes me more aware of my thoughts, emotions, urges, and drives, allowing me to consciously choose to either react to them or not. It allows me to stay with negative emotions and thoughts, and to just let them kind of be there in the background while I’m doing what needs to get done. In addition to that, mindfulness improves my self-control, makes me less self-critical, and reduces feelings of guilt after procrastinating – all things that help with procrastination. I could go on, adding more and more reasons, but suffice to say, mindfulness is one of the most important tools to have in your procrastination toolkit. At its very core, procrastination is an emotion management problem. When we face uncomfortable tasks, we feel negative emotions – anxiety, boredom, frustration, overwhelm – and our strategy for coping with them is to run away and distract ourselves. That’s when we procrastinate, as a tool to relieve negative emotions. We sincerely want to study harder, exercise regularly, meditate daily, or do our taxes on time. But because these tasks make us feel so uncomfortable, we end up delaying them. The key to overcoming procrastination is not to get rid of negative thoughts and emotions, but to act in spite of them. We need to learn to do the thing whether we feel like it or not. To make that happen, we need to cultivate our mindfulness. We need to become aware of when we’re about to procrastinate, stay with the negative thoughts and emotions, and then act in spite of them. Mindfulness, therefore, is one of the most important skills needed to overcome procrastination. One of the best ways to strengthen our mindfulness is of course meditation. If you’re not yet in the habit of meditating daily, I highly suggest you get started as soon as possible. My recommendation is to simply download the Headspace app and start with their 10-Day Journey – that’s the best way I’ve found to learn how to meditate and establish a daily routine. Great tips … it’s so easy to just put things off. Will institute some of these in my life … hope it yields good results! Cheers, man. Let us know how it goes! This insight is fire! I love it. So many people can use this insight to better themselves and get more done during the day. Thanks, Brian. Couldn’t agree more: Mindfulness is the new productivity! i can count more than a few of those rationalizations on my list too. great post! thank you. I’ve done Vipassana to be more aware as well. Awareness is something I cannot stress enough when it comes to overcoming procrastination and improving ourselves in general. Vipassana is a great practice. And mindfulness the key to any positive change in our lives. Great insights. Mindfulness is the key to many things, procrastination being one of them! Couldn’t agree more, Jason! Mindfulness is the key to many things, indeed. You’re absolutely right Nils! 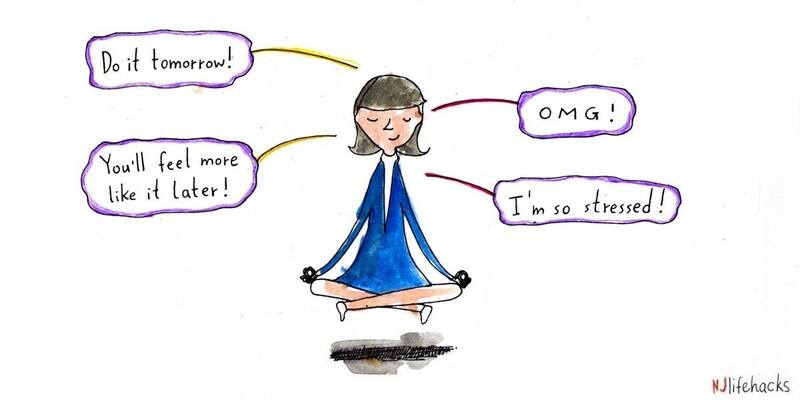 Mindfulness is the key and not just for procrastination. If we aren’t aware of the emotions that arise when we procrastinate, we won’t be able to overcome procrastination. We can all be productive when we are in a good mood and excited about the task we’re working on, but the key is to be able to do what we should do whether we feel like it or not. Perhaps, the first step to overcome procrastination is to realize that feeling the need to procrastinate is a perfectly normal thing, but that we don’t have to be enslaved by our feelings or emotions. As you mentioned we are not our mind! If we don’t take control of your mind, our mind will control us. An effective way to overcome procrastination might be to start a task while giving ourselves the permission to give up after 5 minutes. That may be enough to build some momentum and get in some kind of flow.